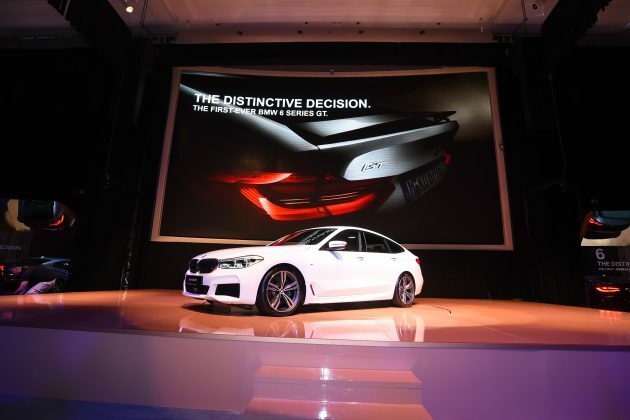 BMW Malaysia today unveiled the First-Ever BMW 6 Series Gran Turismo, the new benchmark for unrivalled space, comfort, and functionality in the luxury vehicle class. 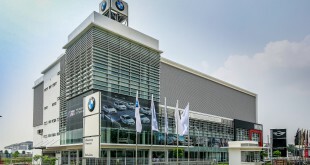 Introduced in the variant badging of a BMW 630i GT, the new vehicle raises BMW Group Malaysia’s expanding portfolio of locally assembled models to nine models and eleven variants, further demonstrating the premium automaker’s commitment to growing its scale of operations and investments in Malaysia, and the country’s position as the hub for the BMW Group in the region. Unique attributes of the previous generation are now honed to a new level in the BMW 6 Series GT, with systematic evolution particularly evident in its sporting elegance, highly advanced equipment features, innovative control and assistance systems, and a leap forward in dynamism and efficiency. The car’s new model designation reflects this progress. The First-Ever BMW 6 Series GT received the prestigious EuroCar Body Award in 2017 for its superior body and spatial design, achieved with innovations such as the BMW EfficientLightweight technology. 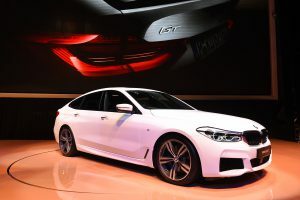 Specifically, the BMW 6 Series GT’s intelligent lightweight construction and increased use of aluminium and high-strength steel types for the body and chassis components helped reduce its weight by an average of approximately 150 kilograms as compared to the predecessor model. The interior offers generous space, while the raised seating position ensures an excellent overview. Three fully-fledged seats at the rear with ample legroom emphasise the travel qualities of the car, as does the fact that the headroom has been increased in spite of a lower roof line – achieved by optimising the seat system. The body construction allows for a large, convenient rear opening with a maximum view through the rear window. The single-section tailgate of the BMW 6 Series GT is opened and closed electrically, with a Comfort Access function that even enables hands-free operation through foot movement. The luggage compartment volume has increased by 100 litres to 610 litres compared to its predecessor: this can be expanded to 1,800 litres by folding down the seats using an electrical control function. The loading sill has also been lowered by five centimetres to the level of the luggage compartment floor. 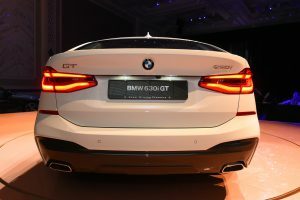 The First-Ever BMW 6 Series GT appears with a distinctive, powerful anterior, with the lenses of the Adaptive LED headlights extending all the way to the large BMW kidney grille. 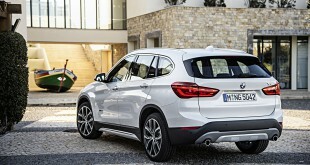 BMW’s signature sporting elegance comes to the fore prominently when the car is viewed in profile, thanks to familiar features such as the long bonnet, set-back positioning of the cabin, a wheelbase of 3,070 millimetres, doors with frameless windows, an elongated window outline stretching deep into the rear end, and the trademark mirrored Hofmeister kink. The roofline sweeps down, coupe-style, to merge into a tail section that is now 64 millimetres lower in height, while the 20-inch M light-alloy double-spoke 648 M wheels in Bicolour (with mixed tyres) add polished sophistication. The rear with its special design elements creates an even more low-slung stance without compromising comfort or luggage capacity. The sloping coupé-style rear window combines with the three-dimensional design of the LED taillights and the hallmark BMW L-shape to generate a classy sports car appeal. 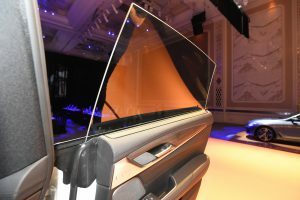 The low-slung silhouette also facilitates the car’s aerodynamic properties, combined with active air flap control and other measures including Air Curtains, Air Breathers and an automatically extending rear spoiler (deployed when the vehicle reaches 110 km/h) to lower the drag coefficient (Cd) from its predecessor’s 0.29 to as little as 0.25. Handling dynamics and driving comfort in the First-Ever BMW 6 Series GT both reap the benefits of the extensive improvements made to the chassis technology. 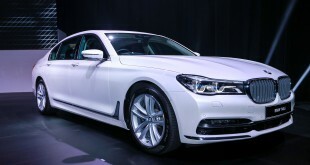 The BMW 6 Series GT is equipped with Adaptive suspension with Dynamic Damper Control and air suspension for both axles. The electronically controlled dampers increase ride comfort and enhance the vehicle’s handling, along with wheel-specific control that counterbalances uneven loads. 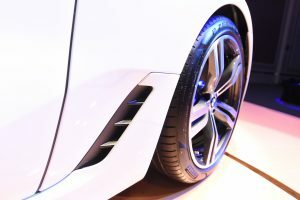 The two-axle air suspension allows the vehicle’s ride height to be adjusted manually, meaning that ground clearance can be increased by 20 millimetres at the touch of a button to negotiate dirt tracks or steep ramps, for example. 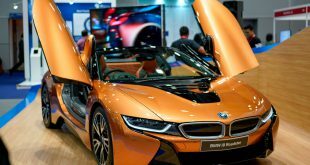 The vehicle can also be lowered by 10 millimetres – either manually by again pushing a button, automatically when SPORT mode is engaged via the Driving Experience Control switch, or when the car’s speed exceeds 120 km/h, in order to reduce drag. Under the bonnet, the cutting-edge TwinPower Turbo engine is teamed up with the eight-speed Steptronic transmission. The 2.0-litre four-cylinder petrol unit in the First-Ever BMW 6 Series GT delivers a maximum output of 190 kW/258 hp and peak torque of 400 Nm. The increase in power and the superior efficiency of the new engine, together with aerodynamic improvements, endows the car with a top speed of 250km/h while optimising fuel economy. It sprints from 0 to 100 km/h in 6.3 seconds, and posts combined fuel consumption of 6.6 litres per 100 kilometres and CO2 emissions of 152 grams per kilometre. 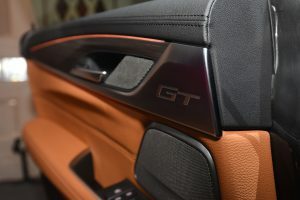 The First-Ever BMW 6 Series GT has been designed to provide a driver-focused cockpit, with impeccable ergonomic arrangement of the controls, and a display and control system offering unparalleled versatility for operating vehicle, navigation, communication and infotainment functions. At the heart of it all is the iDrive system, complete with the Touch Controller on the centre console and the Control Display, now in the form of a freestanding touchscreen. The high-resolution display has a screen diagonal of 10.25 inches, while its tile-style menu layout with animated graphics in live mode facilitates intuitive operation. 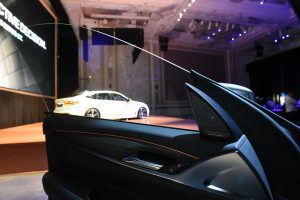 The BMW 6 Series GT also offers the convenience of both enhanced voice control and BMW Gesture Control, as well as the new-generation BMW Head-Up Display. The M Sport Steering Wheel, Sensatec Leather dashboard, and Fine Wood ‘Fineline’ Ridge with Pearl Gloss Chrome complete the stylish look and feel for a premium driving experience. The extremely spacious passenger compartment comes with even more comfort in the form of optimised noise insulation as well as a two-part Panoramic glass roof. The latter has a length of slightly over one metre and a width of 90 centimetres, for an increased sense of space and a light-flooded interior. To top it off, the Harman Kardon Surround Sound System provides an outstanding listening experience. 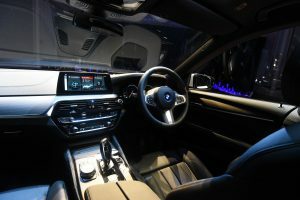 The driver assistance systems fitted in the BMW 6 Series GT make use of the stereo camera, including radar and ultrasonic sensors to monitor the vehicle’s surroundings. Innovative functions for semi-autonomous driving enhance convenience and safety by coming to the driver’s assistance with corrective steering inputs or warnings, such as Lane Departure Warning, Lane Change Warning, Collision and Pedestrian Warning with City Collision Mitigation, Crossing Traffic Warning, and Speed Limit Info. The driving assistance features also include the Active Cruise Control with Stop & Go function which helps to keeps a constant distance from the vehicle ahead at all times. 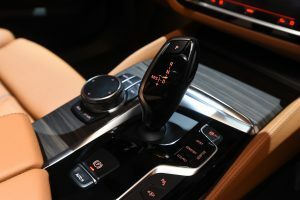 Owners of the First-Ever BMW 6 Series GT can enjoy the benefits of BMW ConnectedDrive, a digital personal mobility assistant to help drivers reach their destination easily and with minimal stress – and not only when they are in their cars. For instance, calendar entries from a smartphone can be used for route planning, the ideal departure time can be calculated and the navigation destination can be transferred to the owner’s car. 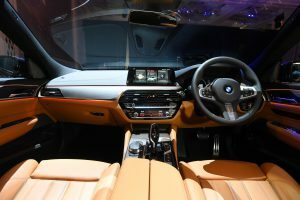 A new smartphone holder is also integrated into the centre console, which allows wireless, inductive charging for mobile phones as well as the display key, further demonstrating the BMW Connected philosophy of the use of technology for convenience. In terms of colour offering, the First-Ever BMW 6 Series GT offers the exterior colour selections of Alpine White, Bluestone, Carbon Black and Sophisto Grey matched with the interior colour offering of Leather Dakota Black. Specifically with the Carbon Black and Sophisto Grey colour options, the added option of Leather Dakota Cognac is also possible. The First-Ever BMW 6 Series GT will be available at all authorised BMW dealerships nationwide from Saturday, 8th September 2018. 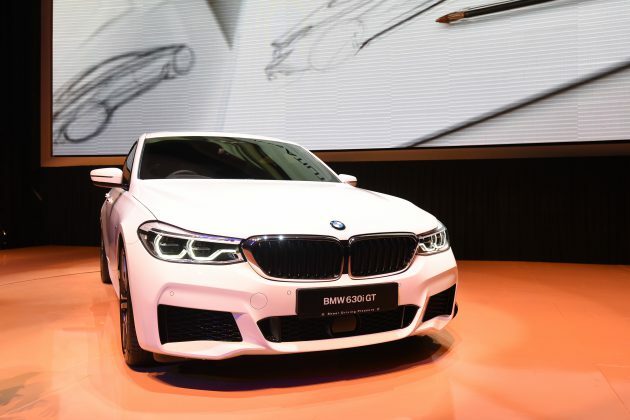 With the Balloon Financing Plan from BMW Group Financial Services Malaysia, the First-Ever BMW 6 Series GT can be owned with monthly instalment plans starting from RM 5,178.00 (based on estimates of an 80% loan on a five-year tenure). 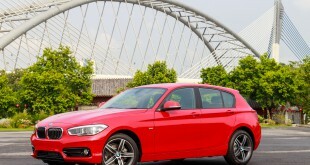 • The BMW Group Loyalty+ Mobile App – BMW White Card. 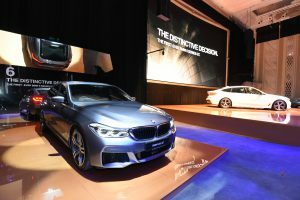 The ESTIMATED retail price (on the road, without insurance) for the First-Ever BMW 6 Series GT is targeted at RM 450,000.00 mark.